Oh the giggles that ensued while reading this book. Meena is unlike any of Eve Langlais’ other heroines and she was an absolute riot. I have read almost all of her books and I can honestly say, I think Meena is now my favorite. 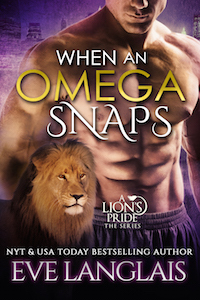 Leo is such a laid back type of lion and these two are such polar opposites, it just makes this couple even more fun to read. Leo is the one getting everyone out of trouble, the calming voice of reason, so to speak. Meena is trouble incarnate. Wherever she is, trouble is sure to follow. When she meets Leo, she is determined (like REALLY determined) to make him see that they are a perfect match. Sparks fly, chaos arises, and the fur flies. The situations that this character gets herself into and the stories of her own childhood antics had me chuckling. Leo is fighting, fang and claw, to not cave in and take her as his mate, even though his liger is all in. “I’m sure I could find something else to eat.” She practically purred the words in his ears. Surely that unmanly “eep” didn’t come from him? It never fails to surprise me how much fun I have reading one of Eve’s books. I dare anyone to read one of her books and not laugh. Her characters come to life, her dialogue is spot on with the situation, and the passion is so hot, it jumps off the pages. Seriously, read her books and find out for yourself. I’ve already pre-ordered the next book because I seriously cannot wait to see what trouble Teena, Meena’s twin sister gets herself into.